Here's my Kourageous Lily of the Valley finished. I had it completely finished Sunday. This block is my May 2011 UFO with Judy's Patchwork Times. Here's a photo of Kourageous so far. I've got five blocks complete...bring on June's challenge! I'm a day ahead of UFO May finish with Judy at Patchwork Times. This is Lily of the Valley in animal theme fabrics for Kourageous. I'm happy with the results. I had two fabrics in the wrong places that I had to correct. One was too far into the section requiring me to just make it over and the other was the last piece of a section. Section L was the remake. I suppose I need to pay more attention to fabric placement as this has happened to me before. You'd think I would have learned a lesson by now! So at the end of May, Kourageous looks like this. What's June have in store for me? Find time to visit more Design Walls today by way of Patchwork Times. The other thing I've been working on is Korrecting Koncealed. 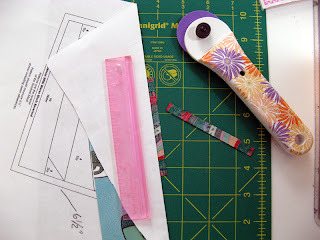 This is the project that helps me find any wording errors in the posts I put to QCA for the Mystery Quilt-Along that I'm hosting there for Quiltmaker Magazine. If you haven't joined the Group and want to...don't wait any longer...it's FREE! Happy Birthday Tiffany. Happy sewing! The largest purchase is 6 yards for a background for my next Quiltmaker pattern by former QM editor Caroline Reardon. The pattern is called Perennial Petals in the March/April 11 issue. I thought I'd make this a scrappy background, but looking at the pattern more in depth having it scrappy might not have the best results. It's those large setting triangles that mess up the scrappy idea. I used a Cozy 20% discount for it. Certainly a beautiful Batik don't you think? 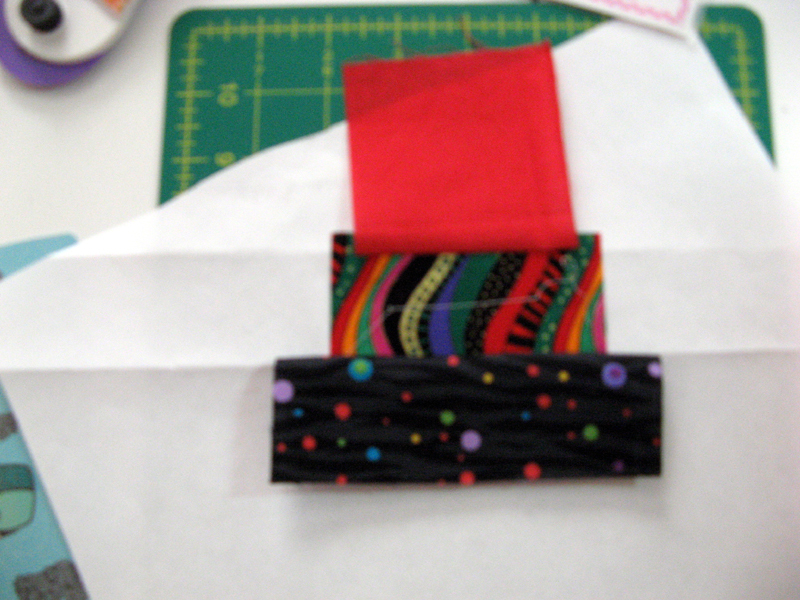 While at Cozy I also purchased two 1/4 yard pieces and the kit for June's BOM for Sharyn Craig's Building Blocks. I've decided to find a gray background, didn't find one that "thrilled me" today; I'll keep looking for it. I've counted the kit fabric too :(! 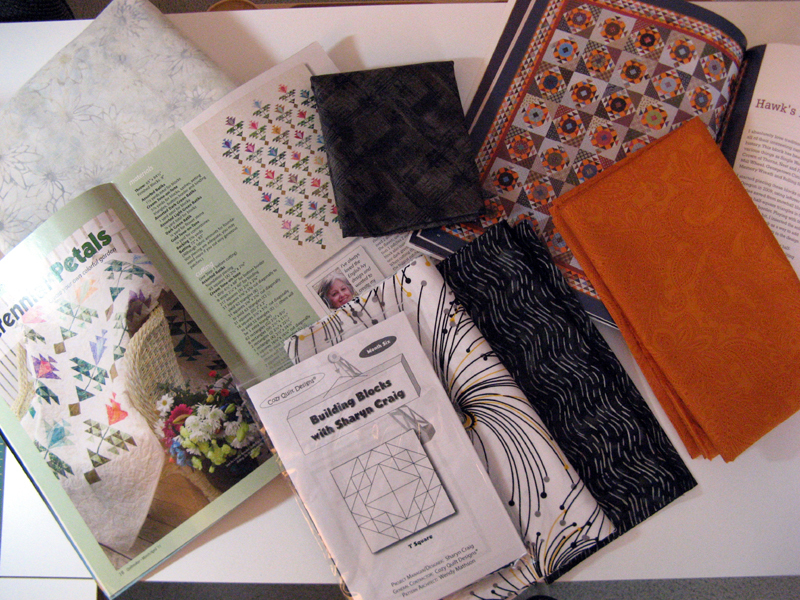 All of these purchases have a planned use, the brown fabric is already attached to Kamel Kountry. The background and cheddar will be used in a couple of weeks as they'll both be my Lakeside Retreat projects. Fabrics have been selected for May's UFO #9 Lily of the Valley block for my Kourageous project. 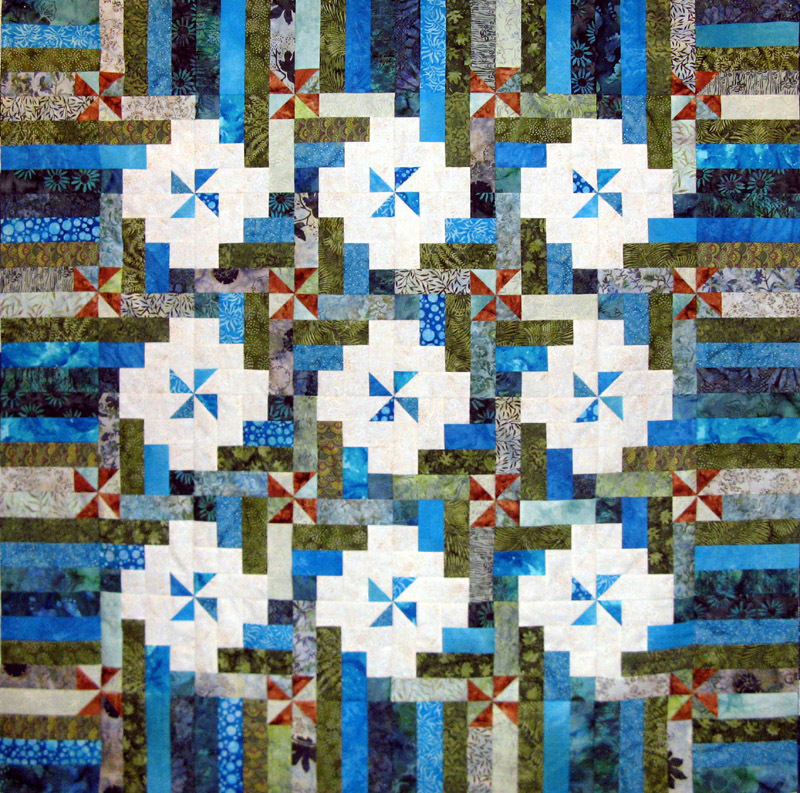 This block is designed by Linda Causee in her book 24 Flower Quilt Blocks. It has 17 sections with a combined total of 150 pieces. 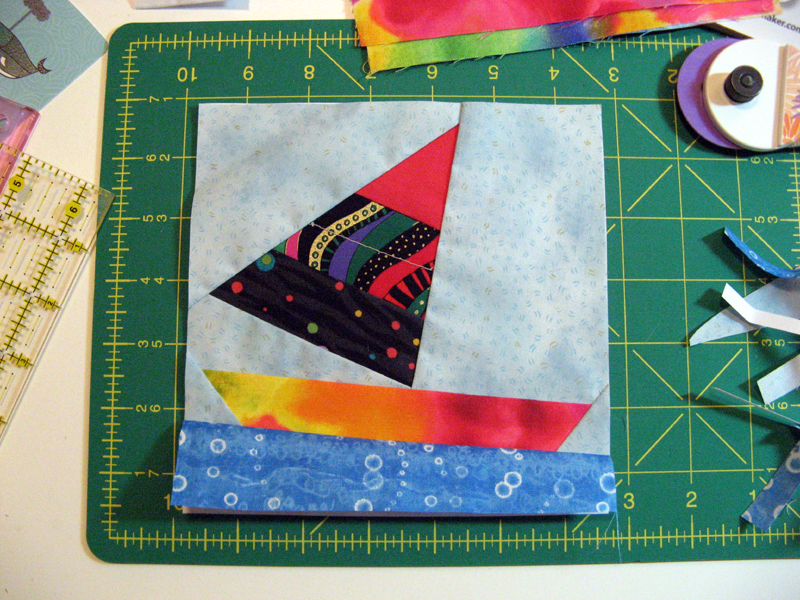 Including the background, I will be using five fabrics for this block. I am repeating the leaf and stem fabrics that I used previously in the Cranesbill block which is a blue green. It appears that I have unconsciously been using brighter yellow greens for the others. Of course I will be using an animal print for the big pieces of the flower...yes there are "big" pieces! Here's Kourageous finished blocks so far. Have a happy sewing week! 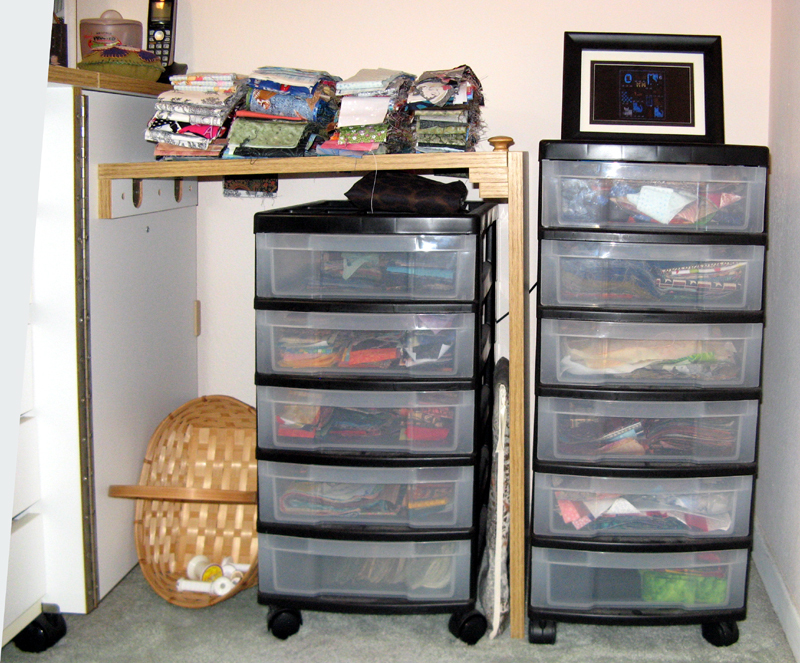 I have on my design wall (sewing table) Kartwheels. I am at two more purple arcs to complete and then it's on to the stars. No further inspiration on what to do about the melons. 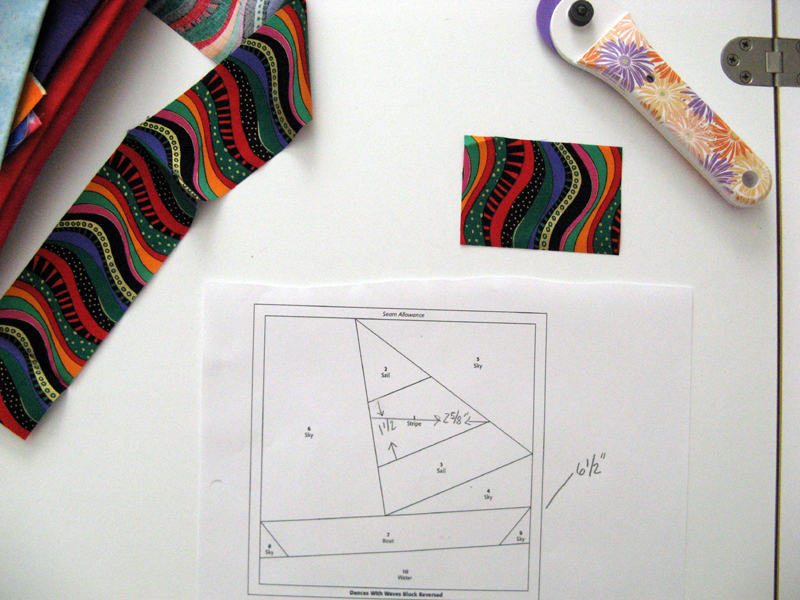 Still time to figure this out since there is a bunch of paper piecing yet to do :)! This is a Judy Niemeyer pattern called Mariner's Star. It is one of my 2011 UFO projects. 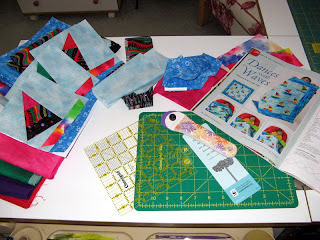 I have been working on my next blog post in my role as the Quiltmaker Quilt Along Online Host. It's due to go live on May 30th. Once I have this task complete it's on to my May UFO. May UFO has me assembling the next flower block for Kourageous which is Lily of the Valley. Kourageous is coming along nicely. I'm sure happy that I chose to tackle this project one block at a time! 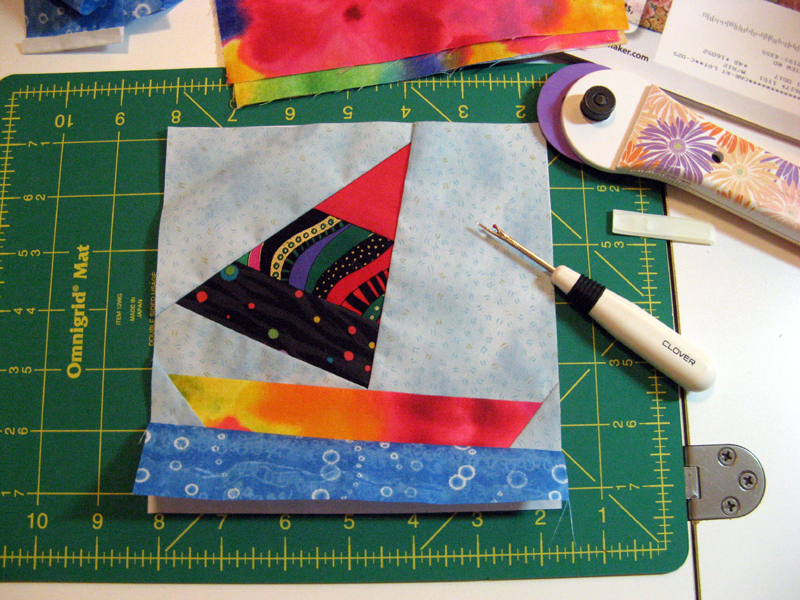 For more inspiration take a stroll through other quilters' blogs by way of Patchwork Times. I spent much of the week emptying the basket you can see (the empty spools are for kitty toys to be made for local animal shelters). I put as much in my stash drawers as I could and the piles of 3" and 2 1/2" just won't fit. I've got to get them to my "remote" stash in the garage until I start a project that can use them. What does fit in these drawers are less than strips in various sizes, the 1 1/2" strips, leftover binding, and orphan blocks. I love these drawers that were "recycled" from a girlfriend's son's going out of business place where he had been employed. Now how's that for recycling...right down to what it's stored in! The sewing I did was on Kartwheels the Judy Niemeyer Mariner's Star project. Kartwheels is one of my 2011 UFOs. I've got ten of the 12 arcs done; next up are the stars. I'm still debating on what to do with the melons. 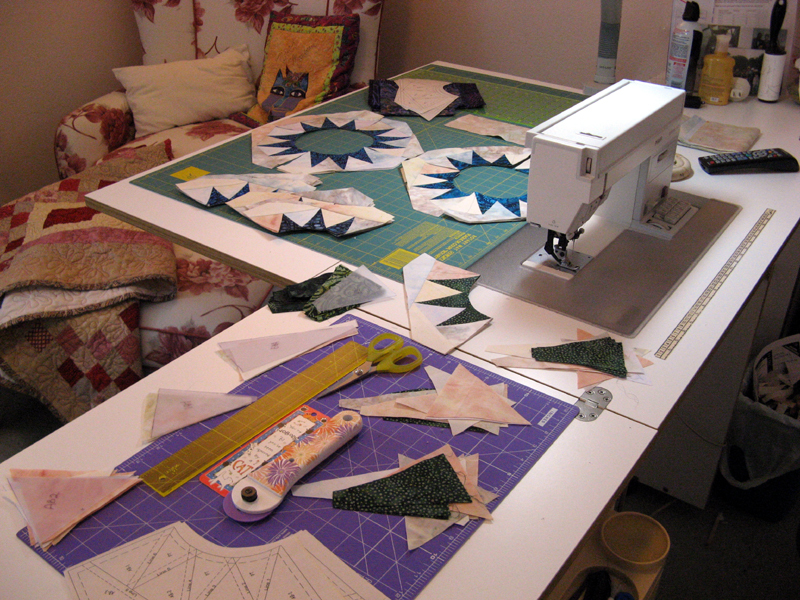 There's a ton of paper piecing to do yet before I need a decision, something is sure to develop between now and then. Yesterday and today I'm working on Quilters Club of America's Part 2 blog post for the Quiltmaker Quilt Along Mystery Project designed by Debbie Caffrey. There's lots to Part 2. Photos aplenty! It's date for posting is May 30. Kamel Kountry is waiting for it's binding. This quilt sure came out spectacular. I've already sent in my entries for the 30th Annual San Diego Quilt Show that's September 8-10. Perhaps I'll have to consider this for next year. I don't have any finishes to report that used up stash this week. Neither do I have anything to report purchased. Another "zero" week...but that's positive too! This is a fun product. I learned of it through a few different sources and thought it would be fun to use sometime. Well that time came with my Kovers project. 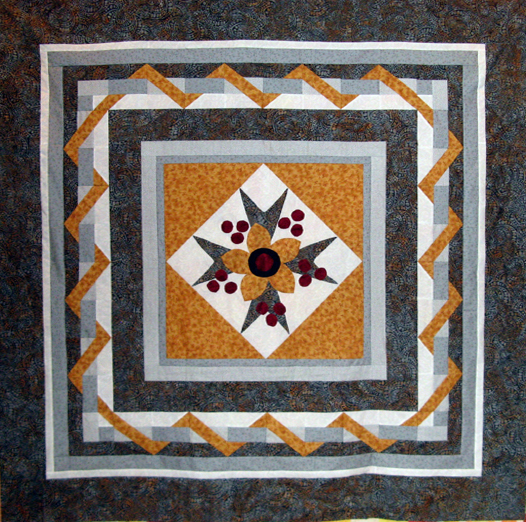 Kovers has an applique center that has berries in the design. I was a participant at the Lakeside Mystery II workshop at Road to California in January with Cathy Farris. Cathy used the product and well that's why I decided to give it a try for Kovers. I'll walk you through the steps I took; it is very simple...don't let the end result scare you off! Texture Magic comes in a couple of sizes. It "shrinks" in size about 30% in all directions. 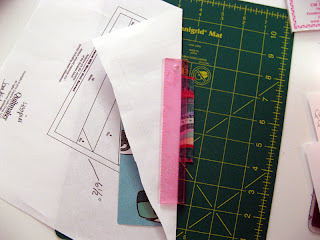 There is a conversion chart included that guides you through how large of a piece you need to start with to finish at the size you need for your project. The first thing you will need to do is determine the size of piece you will need. Next mark stitching lines on either side of the Texture Magic product. You can eliminate this step if you don't need markings. Pin the product to the WRONG side of your fabric. You can add batting between the two layers for some extra loft if you want. The stitches pretty much disappear so I used thread that nearly matched the fabric. Stitch the layers together. Now take the finished piece to your ironing board and using a steam iron apply steam to the fabric side. (You can also use a steamer; if you do the manufacturer suggest steaming directly on the product side.) You'll be surprised how fast it "shrinks". 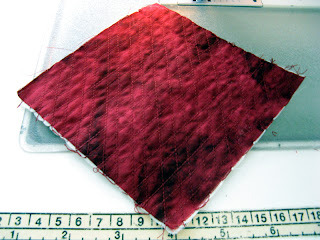 Now get your pattern and mark on the Texture Magic side the shape you need. Cut out your shapes and apply to your project. I used a satin stitch to apply my finished piece to my project so I did not need to allow for a seam allowance to turn under. Kovers is in Kerry's Quilting queue now. I'll be using a gray thread for the custom stitching planned for it. Texture Magic by Superior Threads gave me a nice result for Kovers. Give it a try sometime. Kartwheels is on my table because it's in too many pieces to take to my design wall right now. I've got all the blue and three of the four green done. I am still out on the centers. Not sure if I like the rainbow colored outer melon. I sort of had in mind a single fabric as the melon versus a scrappy one. I put one together to get a feel for it. I don't think there is enough for me to tell yet. Suppose I need to make another three and then perhaps one a single fabric to make a good decision. I've still got plenty to keep me busy in the meantime. The four blocks of Kourageous is on my design wall waiting for the May block Lily of the Valley. I've not yet pulled fabric, but will soon as there's just two weeks left of May! 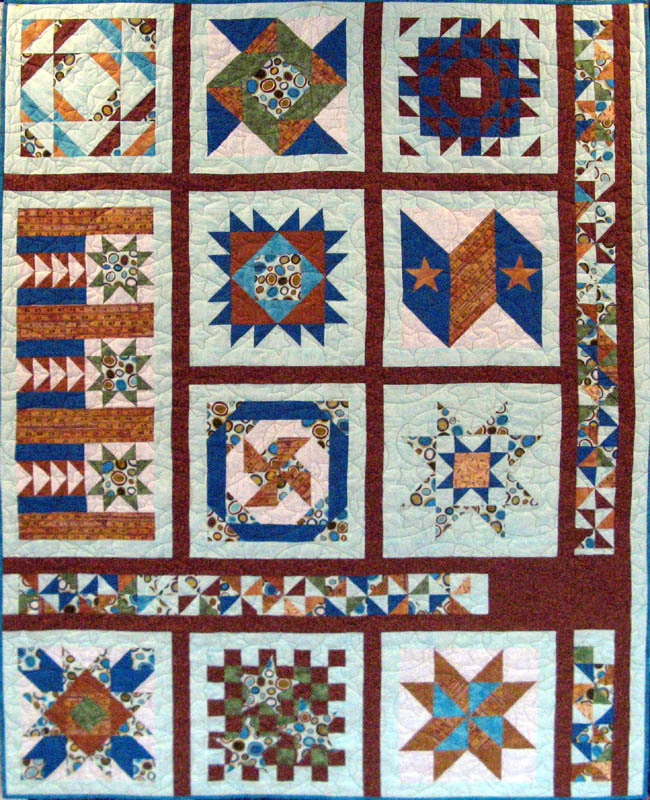 Tonight is Canyon Quilt Guild May monthly meeting. Martha Nordstrom is our guest speaker. She does some incredible applique. 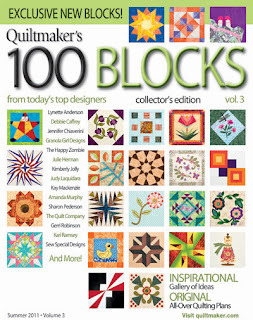 Get further inspiration from other great quilters today at Patchwork Times. I felt very successful after my first quilty lecture at Sunshine Quilters of San Diego in El Cajon, CA on Tuesday of this past week. The guild took me out to a nice Italian restaurant before the meeting and treated me to a nice gift card for merchandise at Memory Lane Quilt Shop in Santee, CA. I have a potential for a purchase, but since it's a gift no yardage to add this week. I'm also at the start of one project and the middle of three others so nothing to claim as used. A null week! 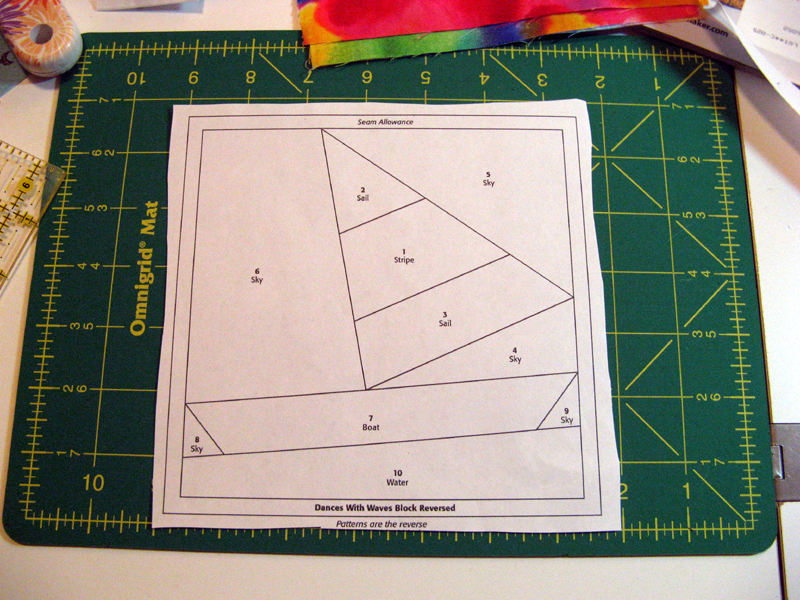 I used the Quiltmaker Dances With Waves pattern to put together a tutorial on paper piecing. It is the next post if you are interested. Awhile back one of my followers asked for it. 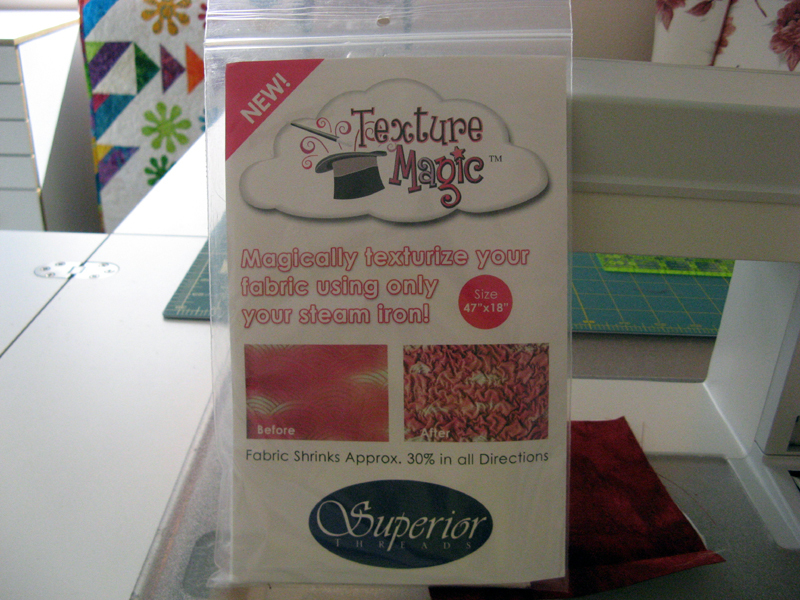 I have another tutorial on the product Texture Magic that I will be posting shortly too. I used the Texture Magic on my Kovers project that is currently in the quilting queue at Kerry's Quilting. It's fun and easy creating a different element. Did you hear me say it's easy? So here's what I'm working on today...Kartwheels. I've got the first four of 12 arcs done. Four each of different dark blues, greens, and purples. You see two of the blues. Green is being sewing now. I'm using five different backgrounds. The background fabrics are from Sew Batik and the other batiks I'll use are stash (mostly from Memory Lane). This is a Judy Niemeyer pattern called Mariner's Star and one of my 2011 UFOs. I've also got Kourageous, Koncealed, and Korrecting Koncealed in work. You can see where I'm at will all three of these at the end of the month. Kourageous is my 2011 UFO that I'm doing with Judy's 2011 UFO Challenge. This month I'm to make a Lily of the Valley block. 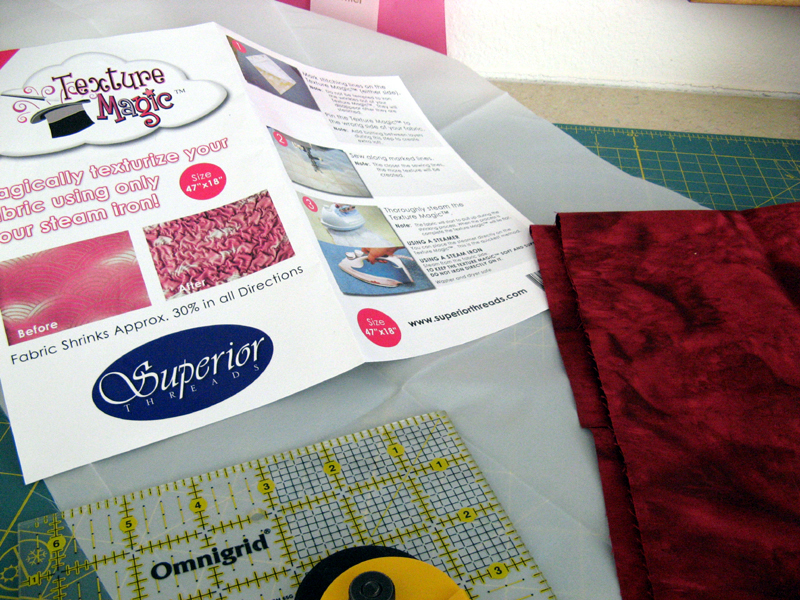 The Koncealed quilts are part of the Quiltmaker 2011 Quilt-Along that I'm hosting at Quilters Club of America. 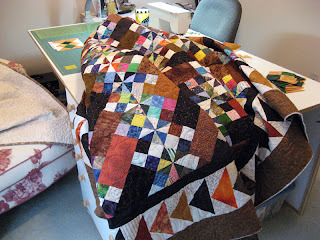 My DH came up with a great name for my Making Ends Meet quilt project, Koasting. This one is my favorite out of a couple others...Kounting and Kompromising. What do you think? 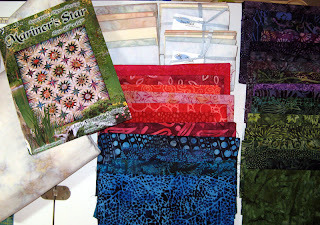 See how others are doing with their stash at Judy's Patchwork Times. 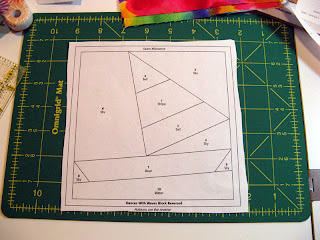 Several have asked if I could put together a tutorial on paper piecing. I've used the sailboat pattern from the Quiltmaker Magazine Jan/Feb 11 called Dances With Waves. This was Quiltmakers Make-A-Blanket Day pattern in support of Project Linus. First reproduce your pattern. Make sure it copies (or prints out) at the exact size as called out in the instructions. 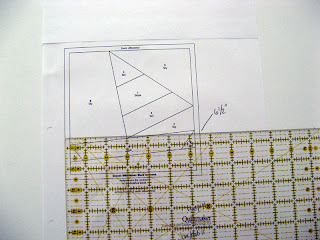 Sometimes there will be a measurement box on the pattern. 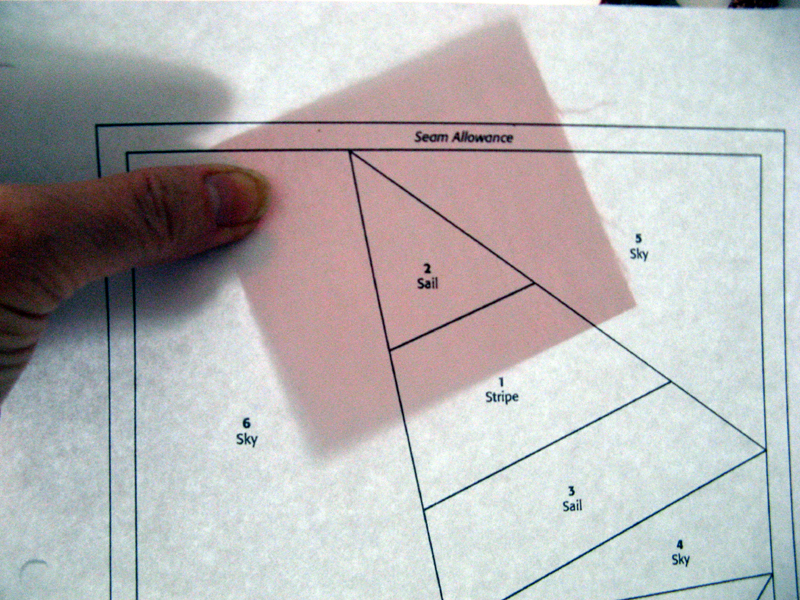 Use a ruler to make sure it measures as it suggests. If you don’t have the right pattern size it will make a difference in your over all finish size. Using the same original and copier setting make ALL the copies you need for your project. 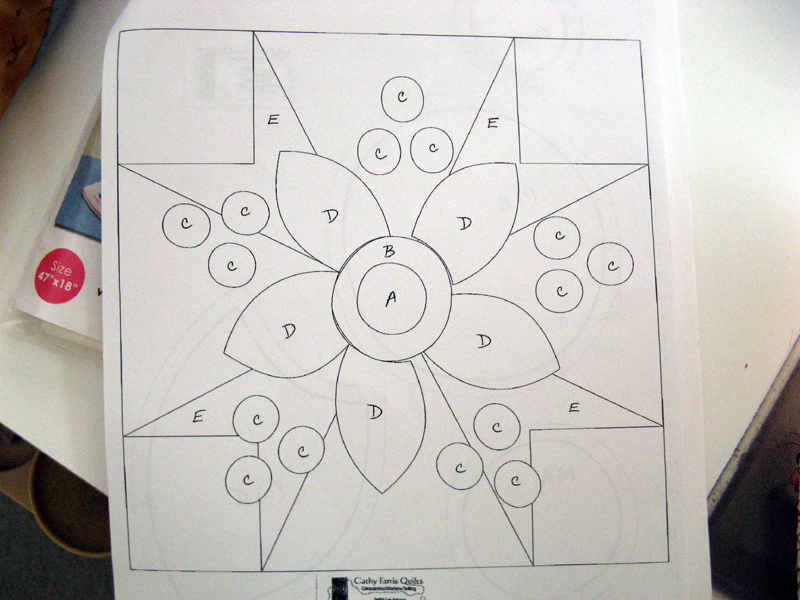 Repeat with each pattern in the project. 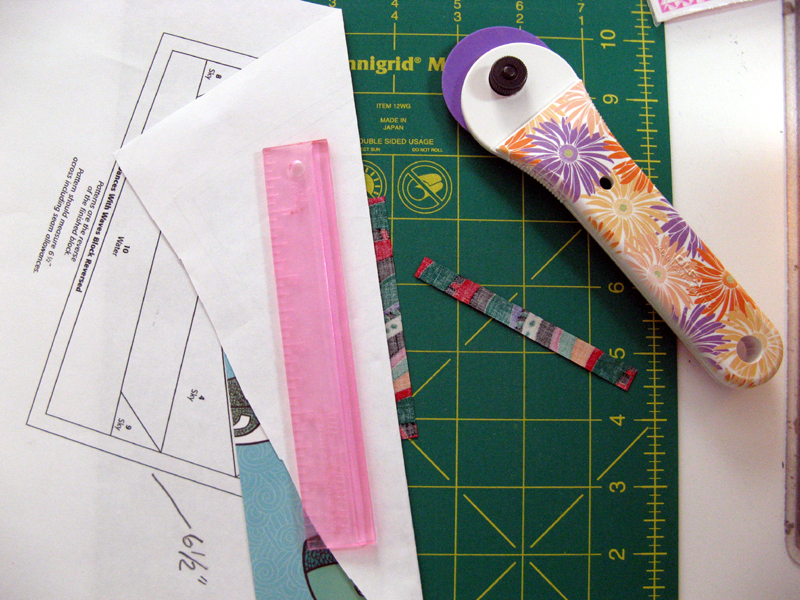 Trim each pattern to make them easier to handle. For the paper piecing method you’ll need a firm straight edge like a bookmark or index card and an Add-A-Quarter ruler. 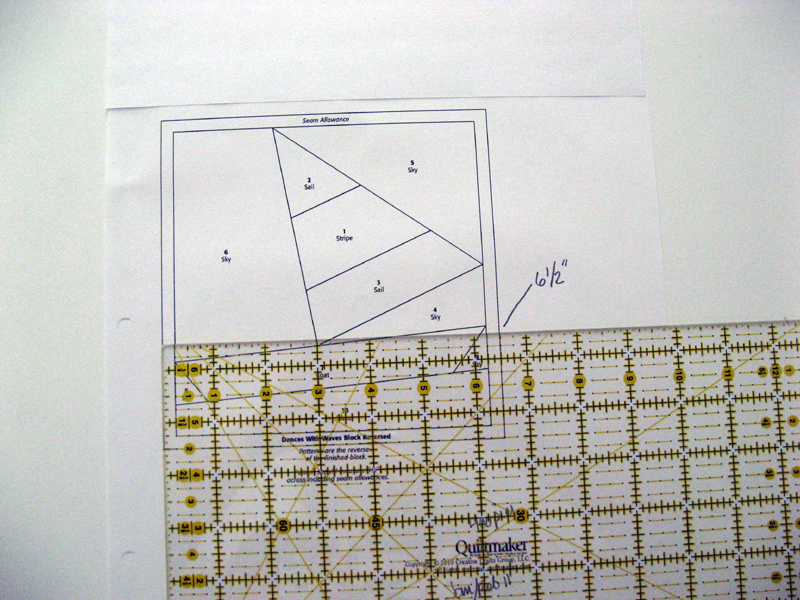 Measure area to cover starting with #1. Cut a strip 1” larger all the way around. You will want your piece to be ½” over the pattern to be covered. 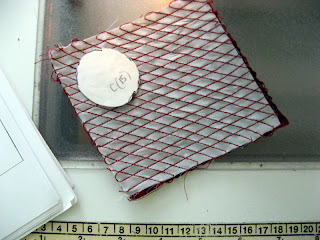 #1 is 1 ½” x 2 5/8”; you will need your fabric piece to be 2 ½” x 3 5/8”. 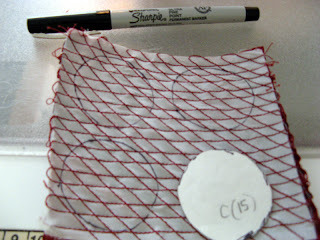 Center the fabric piece from the back of your pattern with right side of fabric facing you. Hold the pattern (you’ll need both hands) facing you with a light behind so you can see through to the fabric. 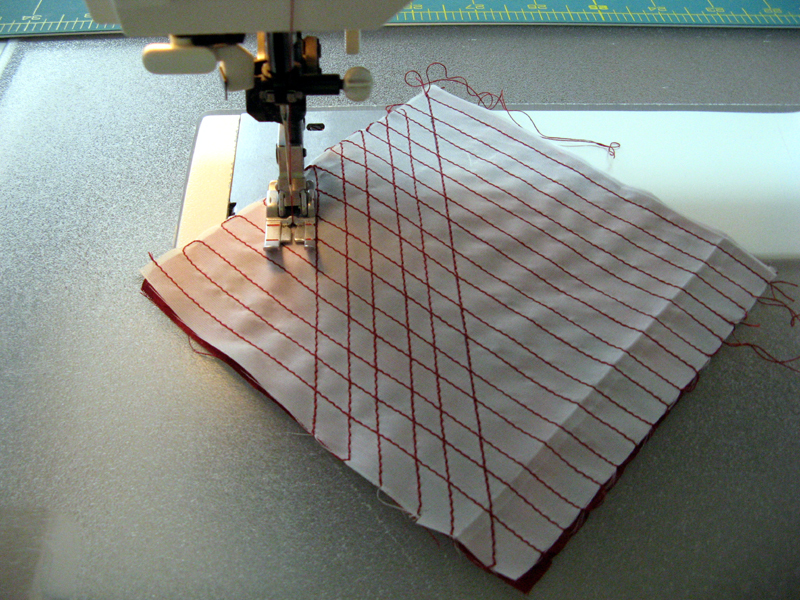 Stitching from the front of the pattern run a basting stitch through the #1 fabric and pattern. Take your straight edge and place it on the line between #1 and #2. 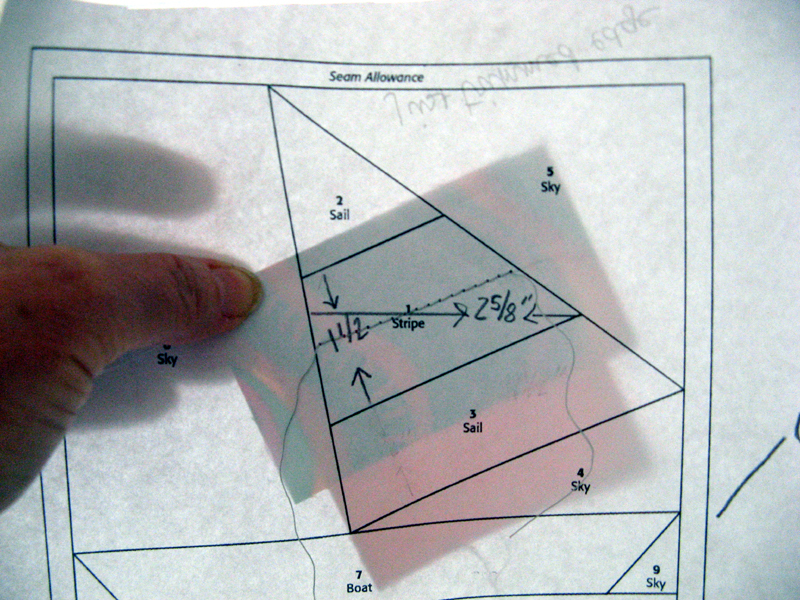 Fold the pattern over the straight edge exposing the fabric. 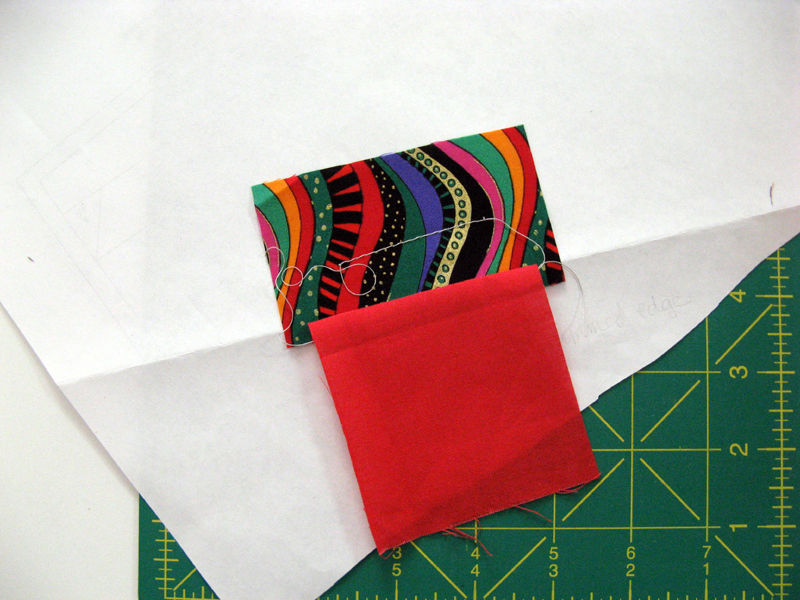 Using your Add-A-Quarter ruler trim away excess fabric #1 over the line between #1 and #2 on the pattern. Measure #2 the same way as you did #1. #2 fabric will need to include the seam allowance of the pattern. 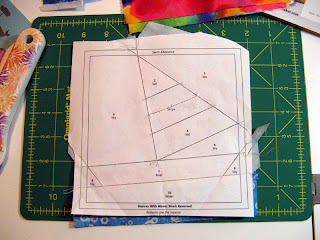 Add an extra ¼” to your piece to cover this. 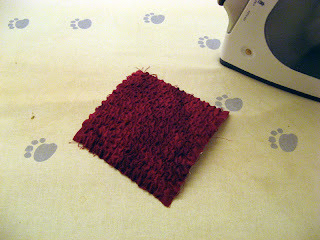 Place #2 fabric piece over #1 fabric right sides together. 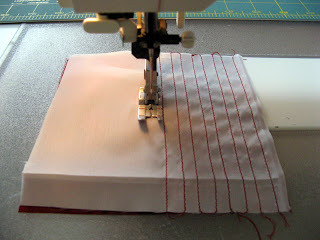 You should be able to line up #2 fabric with its edge exactly on #1 fabric edge (where you just used your Add-A-Quarter ruler to trim excess fabric #1). 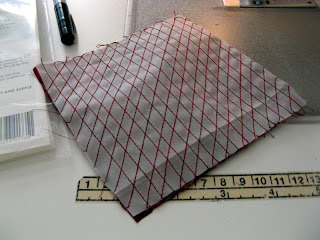 Use your light source behind you with the pattern facing you to make sure #1 and #2 fabrics line up correctly. 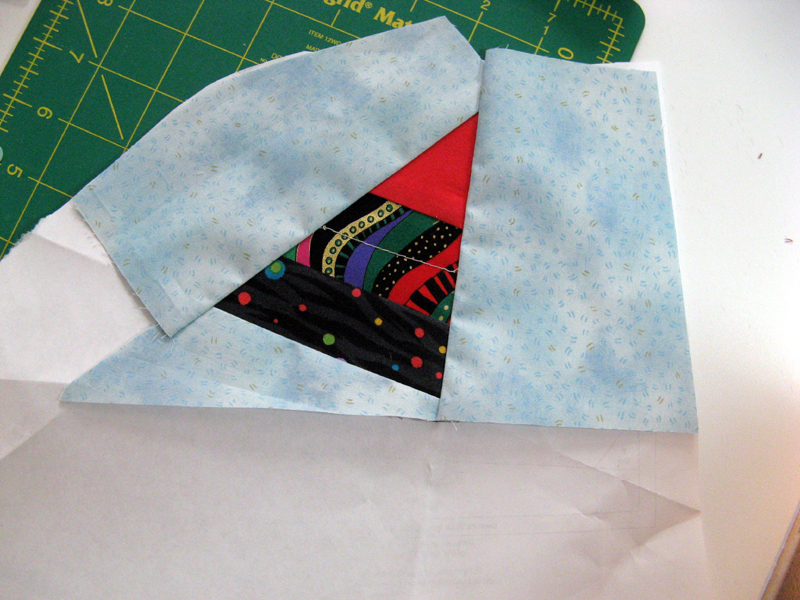 Now the tricky part…holding fabrics in place with both hands flip the unit to the front where you can see the pattern. With a very small stitch length sew from the pattern side on the line between #1 and #2. Start and end a couple of stitches over the line to secure the stitching. Take your straight edge and place it on the line between #1 and #2. Fold the pattern over your straight edge exposing the fabric making certain your #1 and #2 fabrics are still right sides together as you sewed them. Using your Add-A-Quarter ruler trim away excess fabric #1 and #2. Note that there should be very little, if any, fabric #1 to trim. Open fabric #2 finger press and iron press the pieces open. Make sure you have covered each pattern piece entirely with fabric. Continue with each pattern piece in numeric order the same way as with #1 and #2 until you’ve completed the last pattern piece. 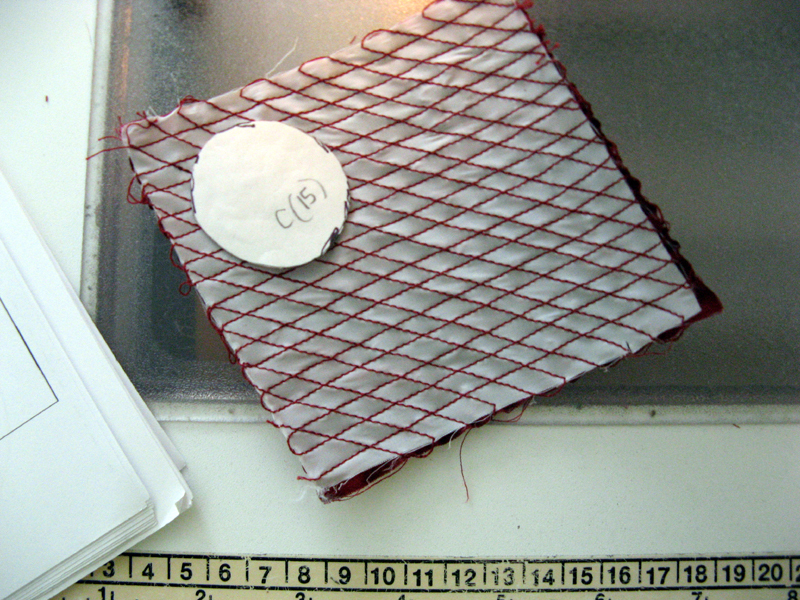 Using a ruler trim away the remaining excess fabric that you will have over the seam allowance. You will be trimming on the outside line. ﻿﻿﻿﻿﻿﻿﻿﻿﻿﻿Once you’ve completed the last trimming you can remove the paper or wait until you’ve attached the unit to the next unit. You will also need to remove the basting stitch on #1. If you have any questions leave me a comment. This can be challenging. You will need practice. The results are worth it! Well I've gotten through several milestones that needed to be done so it's time to spend time on my next 2011 UFO project! It will go a bit slow because I'm still not through all of them, but....Judy Niemeyer's design Mariner's Star is next. My project will be called Kartwheels. This is a paper pieced pattern and all in batiks. These are my most favorite of the techniques and fabrics to work with. All the background fabrics and the back are by Sew Batik. Sew Batik has the best selection around that I've found for wide batiks. So what do you have going on right now? Visit other quiltmakers' design walls at Patchwork Times. Kaos and Koko are making sure they keep me company today...my kidos! I'll be working on the final touches of my 1st Quilty Lecture today and trying to figure out a way to get all the quilts that I want to bring for the trunk show portion. I'll be packing three large suitcases to the "sit on the top" zipper closing! I finished the binding, sleeve, and labels on 2009 Kruisin Kwilt this week. All of these blocks are free patterns picked up throughout the run that was in March of 2009. Each quilt shop offered one. I made up several of them which made became the front and a few ended up on the back. The label has the name, location, and block design from the different participating shops. I did this same thing earlier this year with the blocks from the run that was in March of 2008. I'm sure there will be another of these projects in the future. 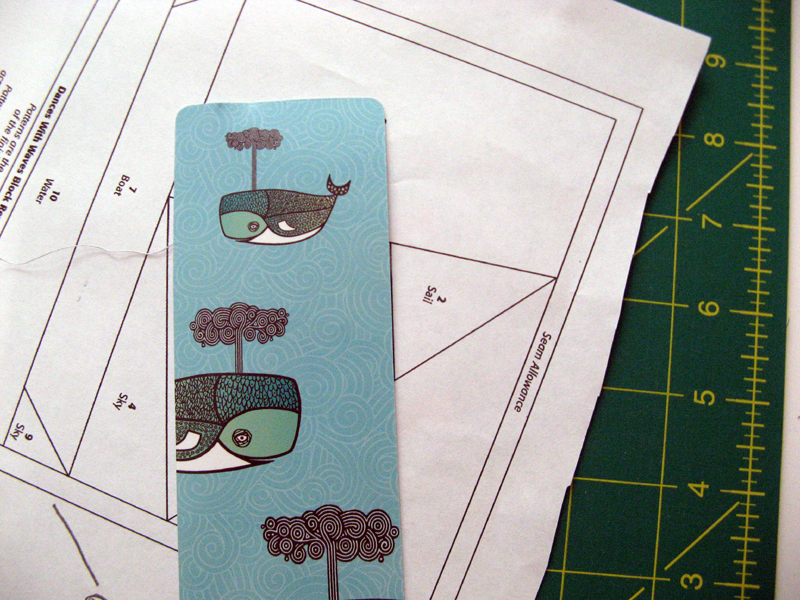 Once again I'm caught up with binding projects and labels. 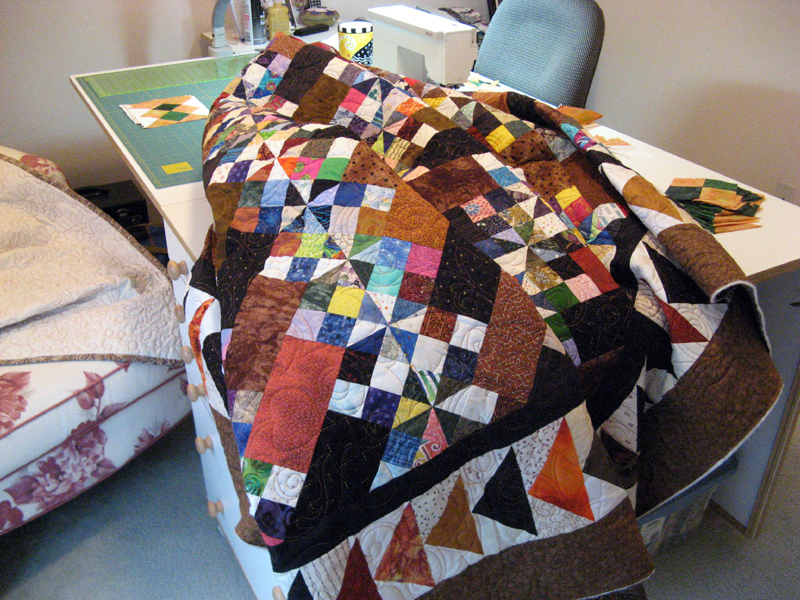 I have three quilts currently in work. Koncealed, Korrecting Koncealed, and Kourageous. 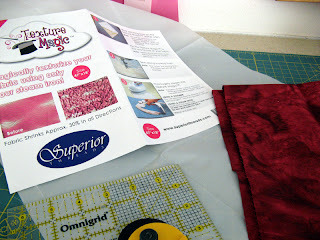 The first two quilts are the two I'm using for the Quiltmaker 2011 Mystery Quilt-Along that I'm hosting. And since they are a mystery of course I can't show you them! Kourageous is my 2011 UFO with Patchwork Times. Kourageous is a compliation of 12 blocks that I'm making one a month through the year. These are the first four that are complete. I've got Lily of the Valley for May. Komfort Kove is now in Kerry's Quilting queue. I'm claiming the yardage used this week. Now for the stash calculations this 19th week of 2011. This one from Quiltmaker Magazine July/August 10 Issue 134 by Theresa Eisinger called Pinwheel Cove was fast, fun and beautiful as it came together. I just love it! The blue is electric in it with the more suttle teal, medium and light greens. I liked her version so much that was featured on the cover that I had to have one of my own--only in Batiks! I've called my quilt Komfort Kove. It's one of my 2011 UFO projects. It will be going to Kerry's Quilting on Saturday and I'll be able to claim the yardage usage on Sunday with Patchwork Times! I've been working on my 1st ever Quilty Lecture that is scheduled for Tuesday, May 10 at Sunshine Quilters in El Cajon, CA. 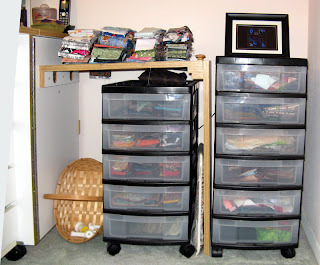 I've had several of my close quilting sisters help me choose what goes into my "trunk show". Now all I have to do is find enough room in two (possibly three) large suitcases that I'll use for the transport. Many of them are large quilts. Its been suggested that the less the folds the more that I'll be able to pack in the space I've got. My topic for the evening is "How to Get Published". All the recent activity with being the 1st Quiltmaker Magazine Quilt-Along Blog Host on Quilters Club of America gives me lots to talk about. 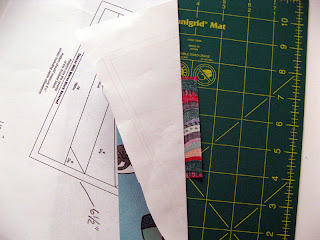 I'm still trying to find the time to put the finishing touches on my Paper Piecing Tutorial. I used Dances With Waves pattern for it. Bare with me...it is coming. Have you been on the Quiltmaker 100 Blocks Blog Tour this week? I've been on Monday and Tuesday and plan to go there next. Some exciting blog sites to visit and lots of opportunities for prizes! Tomorrow is BAE Systems Quilters May monthly meeting. I'm planning a dry run.... Hope your week is filled with quilty things...make sure you visit your sewing room frequently...even if it's just to get good vibes! #9 was selected for May's UFO challenge with Patchwork Times. My #9 is the Lily of the Valley flower block. 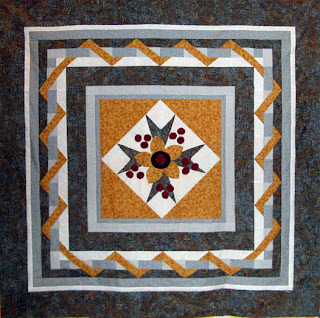 This one happens to be May's Flower of the Month according to Linda Causee in her 24 Flower Quilt Blocks book. Those flowers are pretty small. There are 17 sections and 144 different pieces! EEK! This one's going to be fun!